This is a super easy vegan tofu scramble recipe that only takes minutes to make and tastes delicious. 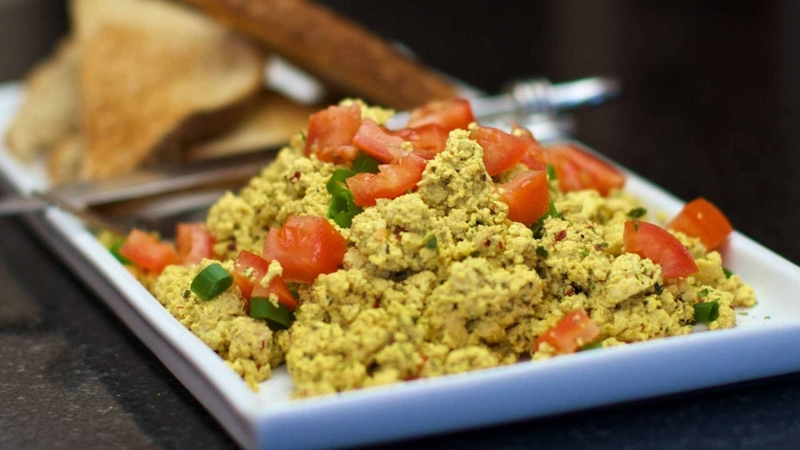 Now you can enjoy vegan scrambled eggs for your breakfast… or any time you feel hungry and want something tasty that’s quick and easy to make! Firstly you will need a large frying pan. Personally I like stainless steel as I think the browned edges of the scramble are very yummy! Add all the other ingredients into the mix. Set your cooktop to high and place the fry pan on the heat. Put aside about half a cup of water next to the frypan as you will need it as the tofu begins to stick to the pan. Stirring regularly, brown the scramble up carefully adding water to prevent burning. After 5 to ten minutes the tofu will soften further. Use you own judgement as to when it's ready to eat. Serve the scramble with a side of toast and garnish with fresh tomato, herbs (I like chives, fresh coriander) and even some fresh chilli if you like spice!